Rugby Town manager Carl Adams has continued to add to his squad tally with the confirmation that midfielders Lewis Rankin and Charlie Faulkner have agreed to join the club for the forthcoming season. Both players have featured for Valley previously, with Rankin returning to Butlin Road for a third spell after previous stints in 2014/15 and 2016. Rankin made an immediate impression on his release from Coventry City in October 2014 - earning himself a contract at Town until the end of that campaign, before returning briefly in Rugby’s NPL relegation campaign two years later. Faulkner also played under Gary Moran in that fateful 2016/17 season on a dual registration basis from Stratford - where Adams was of course his boss too. 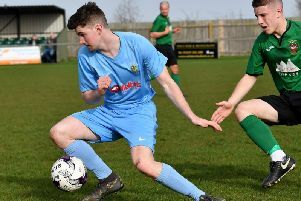 22-year-old Rankin put in an impressive season for Coventry United last time out - scoring 13 goals from an advanced position, whilst Faulkner, 20, spent most of the term at Coventry Sphinx. Another midfielder Harry Holloway has also confirmed he will stay at Town for another season after he signed a one-year contract extension. The 20-year-old Town Youth Team graduate first played for the club in 2015 and made 15 league starts last time out - scoring his first league goal in the last game of the campaign. The club have also announced the appointment of a new Sports Therapist, with Paris Kinlan taking up the key position in Adams’s backroom staff.